Romans invaded the Isle of Britain in 47 AD, and their written accounts provide much of what we know about the Celts, albeit from an outsider’s perspective. 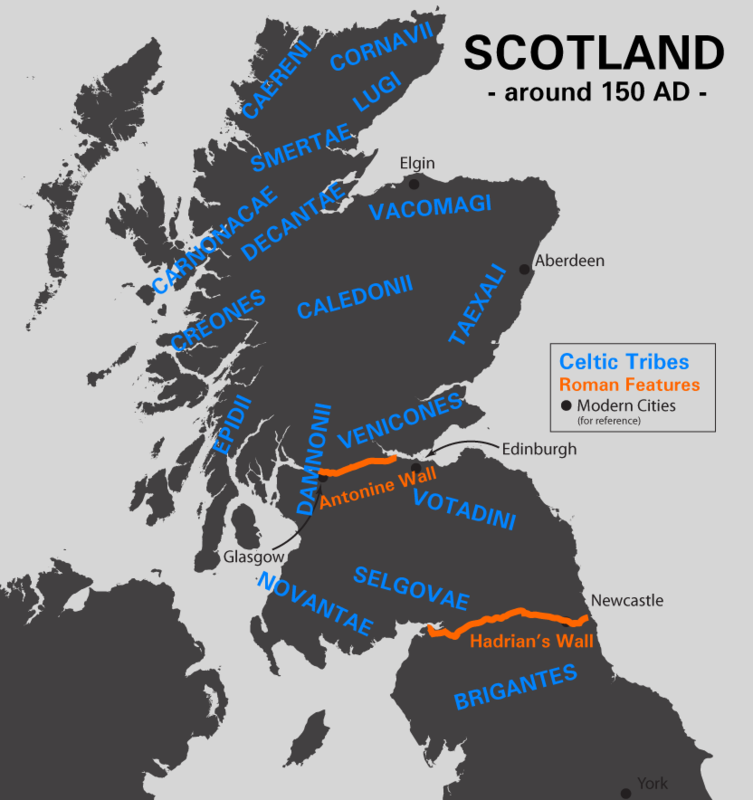 The Roman historian Tacitus called the land of northern Brittania (equivalent to modern-day Scotland) Caledonia, and its inhabitants Caledonians, but in 150 AD, the Greek geographer Ptolemy identified 18 different tribes in Caledonia. Unlike the rest of Britain, the land north of the Forth-Clyde line was never fully controlled by the Romans, so their understanding of the land and its people is less complete than the descriptions of the Celts to the south. In 71 AD, with southern Britain conquered, the Romans invaded Caledonia and established forts up and down eastern Scotland. The tribes of Caledonia were not easily conquered though, and they joined together for the battle of Mons Graupius in 83 AD. Tacitus described the battle in detail: The Roman General Agricola marched his forces on the granaries of the Caledonians, aiming to destroy their stores for the winter and starve them to death. The Caledonians launched an attack against the 17,000-strong Roman army and suffered a terrible loss. According to Tacitus’ (likely exaggerated) account, 10,000 Caledonians perished, while the Romans lost 360 troops. The remaining Caledonians fled into the forest where the Romans could not find them. Despite the military effort to win the land, Caledonia proved to be too burdensome for the Romans to continue fighting for; the well-trained Roman army could defeat the Caledonians on the field of battle, but the Caledonians would not give up the fight. They would constantly raid the Roman camps and supply lines, making their occupation costly and dangerous. The Romans eventually withdrew to the south and settled more permanently around the Forth-Clyde line, building the Antonine Wall in 142 AD to protect themselves. The land south of the Antonine Wall was occupied by several Celtic tribes that was conquered by the Romans, but friendly with the Caledonians and helpful allies in their fight against them. The Antonine Wall took twelve years for the Romans to complete, and was occupied for only eight years before the Romans withdrew to Hadrian’s Wall 100 miles further south, due to repeated allied attacks by the Caledonians and their allies behind the wall. The Romans invaded Caledonia again in 209 AD, when Emperor Septimus Severus personally led the campaign in an effort to expand Roman territory and seek personal glory. The Caledonians are recorded to have lost territory, but inflicted 50,000 casualties on the Romans. Emperor Severus then fell ill and his son, Caracalla, led another expedition meant to punish the Caledonians, this time pursuing the complete destruction of the Caledonians. Caracalla did not aim for battles, instead attacking farms, granaries and any Caledonians they encountered. 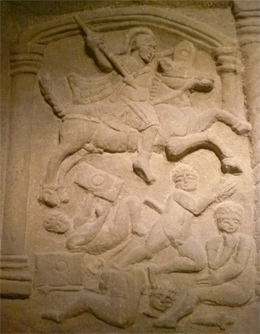 In the midst of the campaign, Emperor Severus died in what is now modern-day York. Caracalla and his younger brother Geta were both declared by the troops to share the title Emperor of Rome. The brothers were not happy with this arrangement; both wanted to be the sole emperor and they threatened to divide the empire between them. With no clear leader and a diminished number of troops, the Romans were forced into a truce was with the Caledonians, and they soon regained all the land north of Hadrian’s Wall. There is little else recorded about the Caledonians for the next hundred years; the Romans seem to have decided to leave them be. There is mention of another Roman invasion attempt of “northern Britain" in 305 AD, but little is written about it. Significantly though, the recorded invasion of 305 uses the word “Pict” for the first time to describe the inhabitants of Caledonia. The oldest recorded Mavers are found in two major areas: along the Firth of Forth, near modern-day Edinburgh, and in the north-east areas of modern-day Aberdeenshire and Morayshire. This coincides with the areas of Roman occupation and the tribes that the Romans identified as Caledonians. Just acoss the river Spey from the lands of the Mavers in Morayshire, there is a hill that is traditionally called "Roman Camp," thought to be the location of a small encampment built during about the time of the battle of Mons Graupius. The land around Edinburgh, where some of the earliest Mavers are found in the 15th century, was just south of the Antonine Wall, the land occupied by the Romans in their conquest. While we will never know exactly what their experiences were, it is likely that our Maver ancestors were part of the Caledonian tribes, all of which were Brittonic-speaking Celts who pre-dated the Roman invasion, and had likely lived there since the dawn of the Iron Age. Our ancestors may or may not have been at the battle of Mons Graupius, but they were almost certainly affected and influenced by the centuries of Roman invasion and occupation. The Romans left Britain entirely in 410 AD. Though they never had a lasting presence in Scotland, they left behind a legacy of Christianity that was carried on by a handful of missionaries. Celtic kingdoms were formed in the wake of the Roman withdrawal, but they would quickly face new invaders. 1: For a more detailed history of Roman Scotland, see the Wikipedia article "Scotland during the Roman Empire". 2: The tribes living south of the Antonine Wall and north of Hadrian's Wall were (using Pliny's names) the Damnonii, Otadini, Novantae and Selgovae. The records also specifically mention the Maeatae as allies of the Caledonians, but their location is less certain. Scotland about 150 AD (click to enlarge).